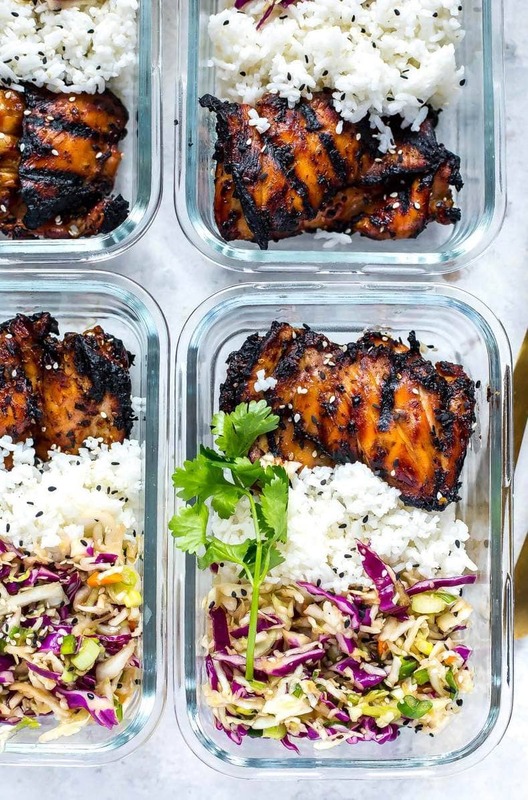 These Korean Chicken Meal Prep Bowls are a healthy make ahead lunch idea made up of chicken thighs, Asian coleslaw and jasmine rice! 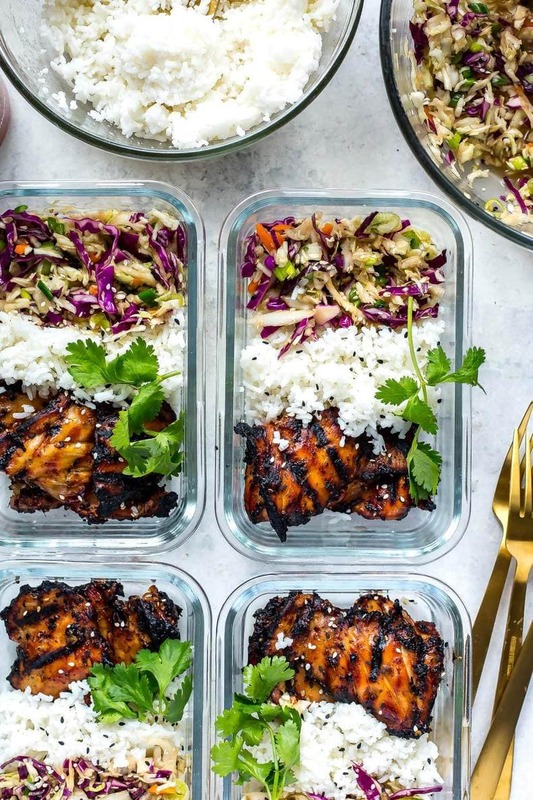 Hey New Year, meet Korean Chicken Meal Prep Bowls! Aka my fave new meal prep recipe next to these Sweet Chili Chicken Bowls. If you're looking to get serious about meal prepping and make more delicious bowls like these, you HAVE to sign up for my free 5-day challenge below! 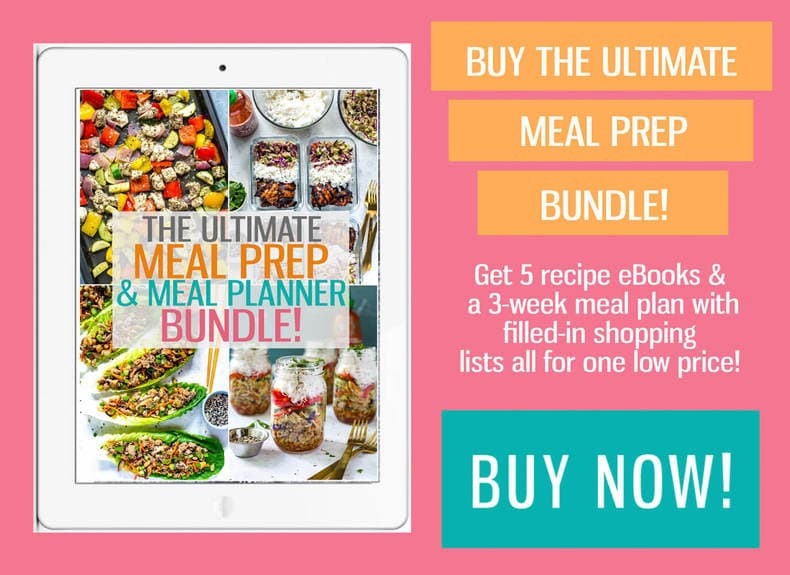 It's going to get you on the right path and give you the structure you need to meal prep like a pro! Yes, I know, I say that alot. But honestly, this Korean Chicken is totally worth the hype – it's been a regular rotation at the family dinner table for over 10 years now, and there's a reason we keep making it over and over. It's just so damn good, and SIMPLE! I can't take TOO much credit for this recipe as it basically originated from Canadian Living magazine. It's one of my favourite magazines for simple, easy recipes you can make at home using basic ingredients. No running to the store for a spice you'll only use once, and most of the stuff in there looks pretty delicious. I think my mom's got pretty much all her recipes from there and Clean Eating magazine, but being a food blogger I've convinced her to get on Pinterest and she's grabbed a few amazing recipes from fellow bloggers too. But this Korean Chicken goes way back. 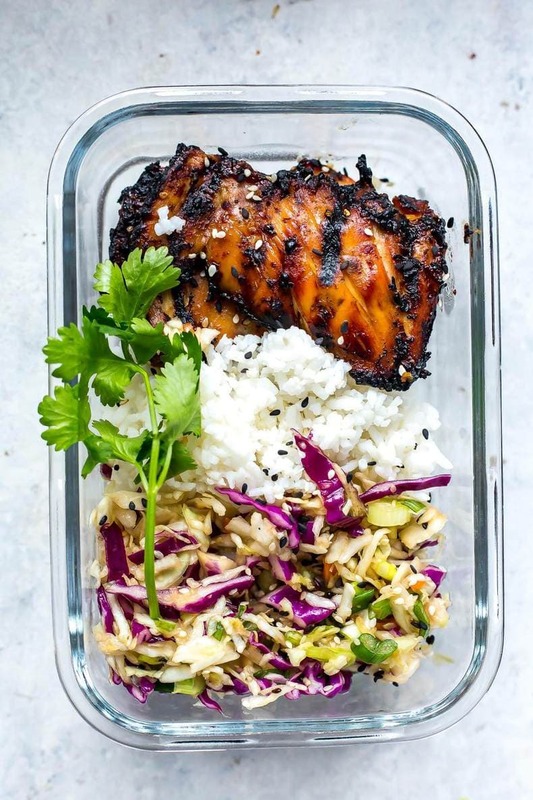 I've put my own spin on this Korean chicken of course and I also added an Asian-inspired coleslaw along with some jasmine rice to turn it all into proper meal prep bowls, and I think you will find the results pretty delicious. If you want to keep these Korean Chicken Meal Prep Bowls low carb, you can swap out the rice for some steamed broccoli or cauliflower rice too. They are sooooo versatile and easy! I've tried to make the Korean chicken a little healthier, swapping out the sugar in the Canadian Living version with honey, and using low sodium sauce (you could also do tamari) and using half the sesame oil like my mom does. The meat really shines when you cook it on the grill, but I've included instructions to cook it in the oven too in case you don't have access to a BBQ or don't want to head outside in the cold weather. If it were up to me though, I would BBQ all year round. I swear it makes any cut of meat absolutely delicious. Here I am in the middle of January just dreaming about summer and BBQs now LOL. Basically, you will prepare the rice and coleslaw while the chicken is cooking. The chicken should take about 15-20 minutes and that gives you more than enough time to whip together the dressing for the Asian-inspired coleslaw – another favourite recipe of mine that is so easy and uses many of the same ingredients for the chicken too! If you like different spins on coleslaw you should also check out the citrus slaw that goes along with these Kalbi Beef Tacos! 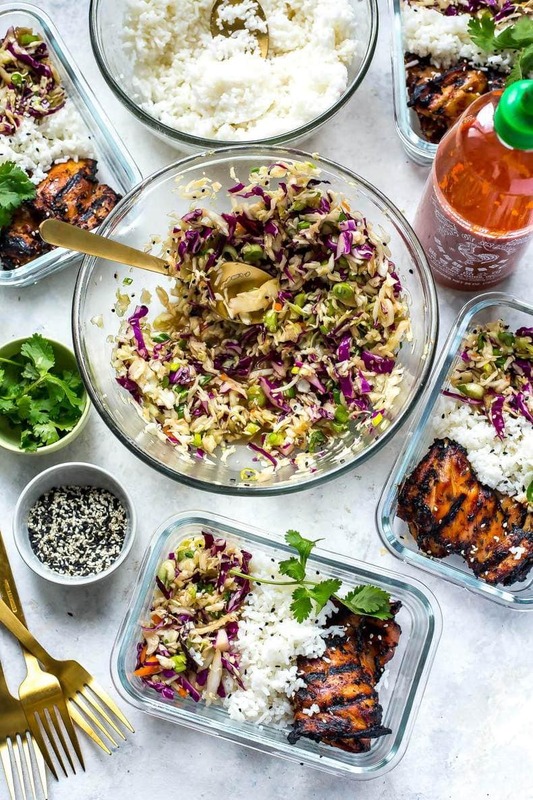 If you're prepping these Korean Chicken Meal Prep Bowls for the work week I would recommend holding off on adding the dressing for the coleslaw until the time you're going to eat it – pack a bit of the dressing in small separate bowls and drizzle it on at lunchtime. Alternatively, you can use a store-bought Asian sesame dressing if you're lazy or already have some on hand. I LOVE Renee's Asian sesame dressing and that's what we usually use when we pair our own Korean chicken with a salad so don't be afraid to look for a dressing with clean ingredients to save time. 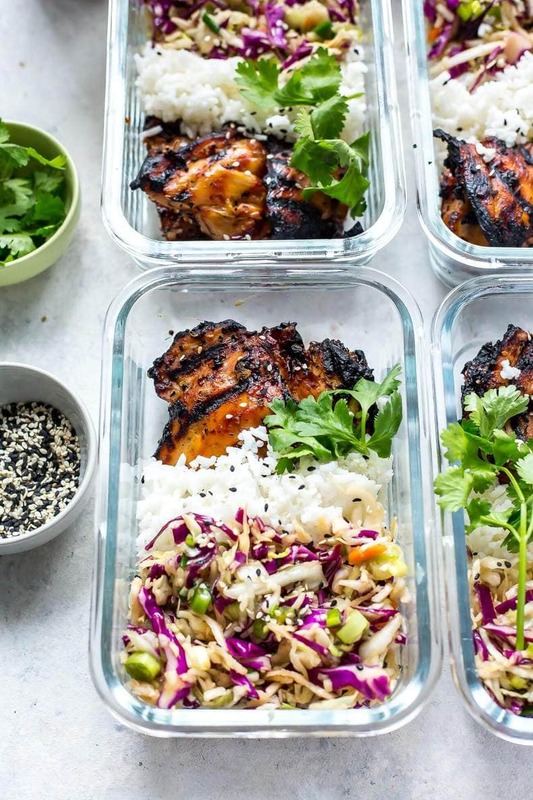 Will you be making these Korean Chicken Meal Prep Bowls? Hopefully I'll get you on the meal prep train with these delicious bowls! And don't be afraid to turn this into a family style dinner either – or whip them up for yourself and then eat the leftovers all week long. That's how I meal prep! Stock up on jasmine rice while you’re at it. If you're looking for delicious grass-fed meat and poultry, then look no further than Butcher Box – and for a limited time get two free ribeyes and bacon! 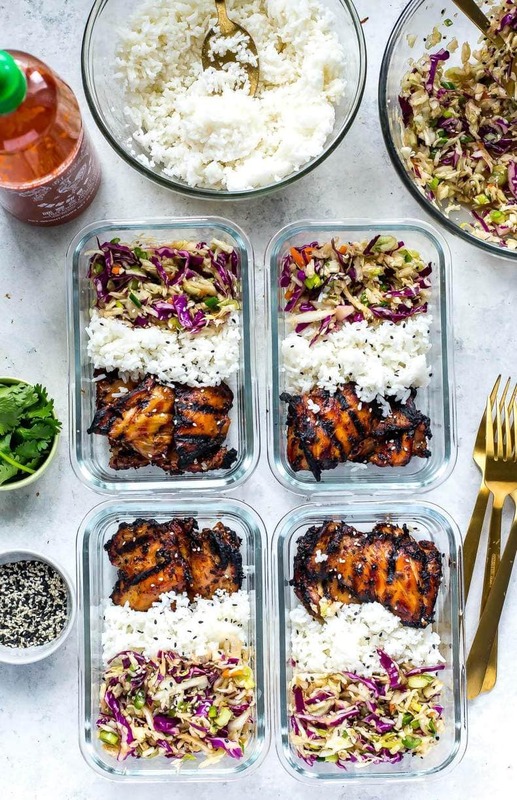 These Korean Chicken Meal Prep Bowls are a healthy make ahead lunch idea made up of chicken thighs, Asian coleslaw and jasmine rice! Korean chicken recipe adapted from Canadian Living. Preheat grill to high heat, or preheat oven to 425 F. In a large bowl, mix chicken marinade ingredients together. Add chicken thighs and marinate 15-20 minutes. Meanwhile, cook jasmine rice according to package directions. Mix together ingredients for Asian slaw dressing, then set aside. Add rice and coleslaw to each meal prep bowl. Add chicken to grill or frying pan. Cook on grill for 5 minutes, then flip and cook another 3-5 minutes depending on how large the thighs are. If using the oven method, cook for 25 minutes until fully cooked. 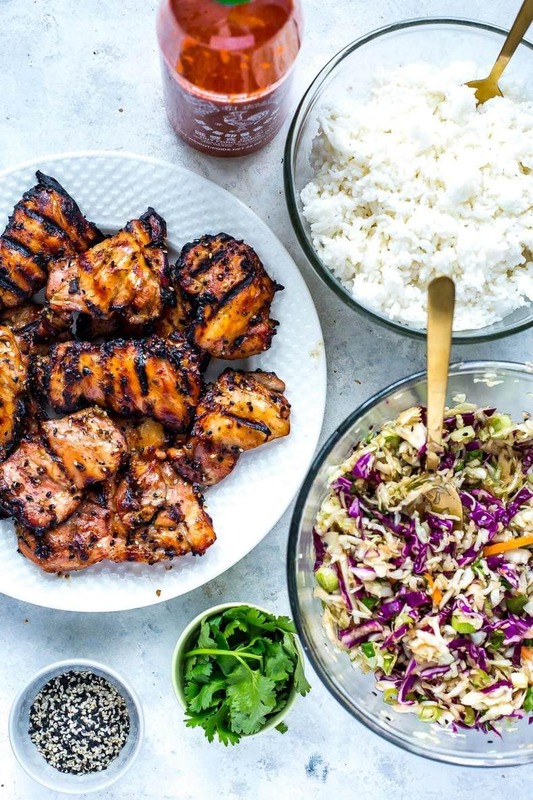 Add two chicken thighs to each meal prep bowl and pack a bit of Asian slaw dressing on the side to add to coleslaw mix the day of (it gets soggy if you add at the beginning of the week). Serve and enjoy - leftovers stay good in the fridge up to 5 or 6 days. So do you eat the whole meal cold? Or do you heat it up with the coleslaw in there?! I usually take the coleslaw out into a separate bowl if I want to microwave – otherwise sometimes I do eat them cold, it’s up to you! What is the time if using oven? So sorry about the mix up Star! I have updated the recipe, you should bake in the oven for 25 minutes! These look delicious! I will be trying this for dinner this week. Just want to clarify, is the ginger in the recipe fresh or ground? I love ginger, but don’t want to over do it, lol. Thanks! Thanks for a quick reply 😊 I made this tonight exactly as written, except with a sprinkling of crushed red pepper in the marinade. It was all absolutely delicious! Thank you so much. The whole family enjoyed and I made leftovers (minus the rice) into a wrap for lunch! Made this tonight. Couple questions! The dressing for the salad, I’m assuming that isn’t enough dressing for all five meals? I felt like it was enough for maybe two at most. Also. Do you season the rice at all? Hey Brian! So happy you gave these a try 🙂 The dressing is definitely enough for the coleslaw – cabbage gets weighed down by liquid very easily so you don’t want to use too much of it or it can get soggy and overdressed. I also don’t season the rice at all, but you could add some soy sauce overtop! I find everything tends to have enough seasoning when you combine it all considering the chicken and coleslaw have a ton of flavour. Hope you like them! Hi im planning on making these for lunches during the week, do you think it would be okay to use the masterfoods finely chopped ginger that i have in my fridge as i dont have fresh, will it still taste the same? I am making this tonight. Quick question..what is the approx weight for 10 chicken thighs? i bought 10 full thigh filet n about 1.5kg. Is that too much? Made this last night n it was yummy. will definitely make it again. May i know what is the approx weight of chicken in this recipe? Hey Jess! So happy you liked it! Unfortunately I don’t provide the weight for meat/poultry in my recipes – I don’t have a scale at home. Sorry about that! I made this last night for dinner and we all loved it! I did a couple small additions to taste – added a bit of brown sugar to the marinade and some crushed chow mien noodles to the slaw just before serving. Will definitely be making again! You can get the glass meal prep bowls here! Would this work to prep and freeze? thanks so much! It includes everything. If you put this into MyFitnessPal and use boneless chicken breast it comes out with less calories. Don’t but this in as a whole meal. Separate it out. I used 8- 4 oz chicken breast. Create the recipe. Do the same for the Asian slaw. My favorite meal prep recipe of all time!! I just made this again for the 10th time and wow does it get me excited to eat the same thing for a week! I cook mine in my Insta Pot – instead of marinating the chicken I put everything in the pot (plus the chicken), manually cook it for 8 minutes, and voila! Juicy, tender chicken on top of jasmine rice or cauli rice and I always add fresh mango to mine 🙂 Yum!! The calories for this is incorrect. I’ve got about 550 calories as this recipe is. Not bad considering it’s an entire meal. I did not enjoy this meal even though it smelled good while cooking. Since I have another bowl left I’m going to try to fix it- more sauce maybe? Forgo the rice for more veggies maybe? It was dry to me. Hey Liz – the calories are a best estimate, I’m sorry that this appears to be a little off according to your calculations. I’m also sorry to hear you didn’t like it! It is often a matter of personal taste and preference. These happen to be one of my fave bowls but I understand everyone has different tastes. If you didn’t care for the recipe, I’m unsure what suggestions to make for you to fix it. What size is the bag of coleslaw? I used a 400g (aus) for two meals. Would that change the Marcos much? Thank you! It’s delicious! I made this tonight and it was delicious! I added some chilli flakes in the marinade for a bit of kick. Highly recommend bbqing the meat!